Every time we listen to the Bowerbirds, we’re reminded why we became fans in the first place. 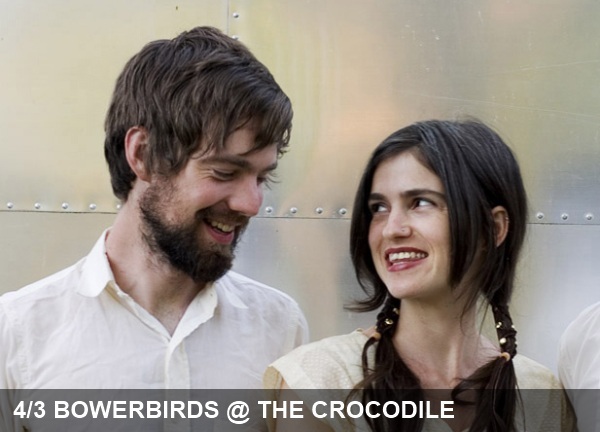 Somewhat akin to Andrew Bird with less whistling and fewer string-based flourishes, the Bowerbirds play thoughtfully-crafted, understated folk music that moves beyond sonic preconceptions that often accompany folk, or really any label of a certain genre. Whether you’re a longtime fan or just intrigued by the sound of them, we recommend spending time with the bands recorded material. Once you’re on board, head over to The Croc to take in the live experience for yourself.